WTTU Music Special with Weston Skaggs! 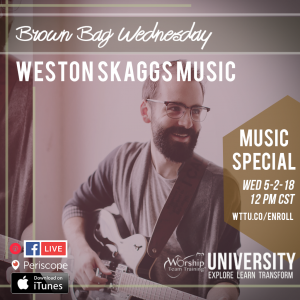 We are excited to have this Brown Bag Wednesday show with Weston Skaggs! Watch the Video Interview below to hear some of Weston’s new music! Weston is a Cleveland, OH area worship leader and singer/songwriter signed to Old Bear Records out of Batavia, NY. His musical style is experimental and modern but tinged with folk and gospel stylings. As a father of two and husband of one, Weston’s family’s story (a near death experience, post traumatic stress, infertility, and adoption) weaves its way into my music. His heart for the church is to find balance in worship. Balanced worship is Christ centered worship.